Both NEFT and ECS are types of electronic payment and settlement system which is used in developed country and developing countries also. So it is a type of modes which settles transactions in batches at a particular time. The full form of NEFT is National Electronic Fund Transfer which is a countrywide payment system enables one to one transfer of funds. In India, it was first launched in 2005, November. NEFT enables the individuals or to an entity to transfer funds electronically from one bank to any other bank which uses this system. In NEFT the transactions are settled in batches during the specific timings. To avail the benefit of this system, one's bank has to be a NEFT enabled. Those who are not a customer of a bank can also avail this benefits by instructing bank for particular transaction. The full form of ECS is Electronic Clearing Service introduced by the Reserve bank of India. ECS is used for the transfer of a high volume and repetitive funds from one bank account to another. The bulk transfer includes low-value transactions and it is divided into two categories. ECS transactions are settled locally in the current accounts maintained with a bank which manages the clearinghouse. The payment or receipt of ECS are repetitive in nature and it occurs regularly. NEFT is a country-wide electronic fund transfer system used by banks from one to one. ECS is an electronic fund transfer from one bank account to another bank account with the help of services provided by the clearinghouse. NEFT has high volume transactions with high value. ECS has high volume transaction with low value. NEFT settles transactions in batches. ECS settles transactions in few days. In NEFT, the charges varies from transaction value to transaction. NEFT is a cost effective for the customers. There is no charges at all so it is cost free to all the customers. In NEFT, there is no risk involved to the customer because it automatically transfer the fund when due date and time occurs. Customer has no need to visit any branch of the bank or to remind. In ECS also there is no risk involves like theft or a fear of fraudulent payment. 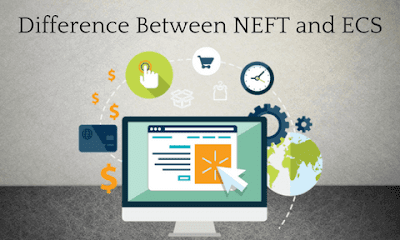 For NEFT, a bank must be a NEFT enabled to make the transaction electronically and speedy. For ECS, There must be a registration with the approved clearing house to make payment through it.